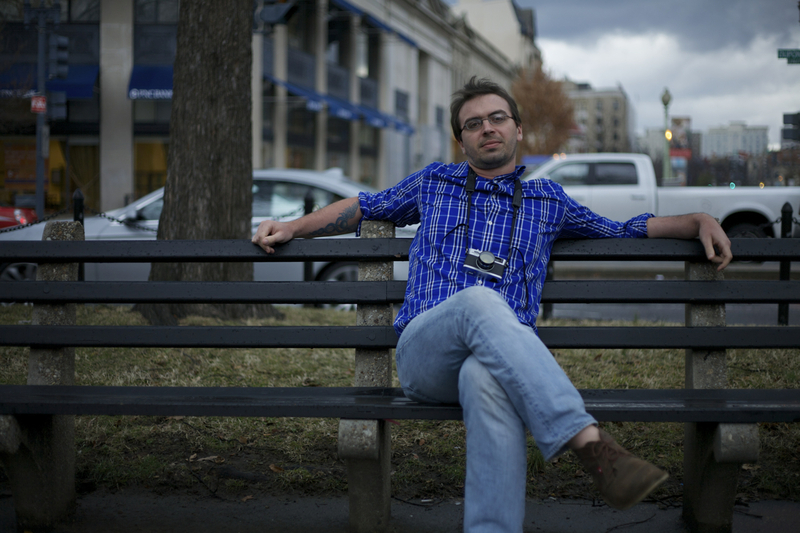 Peter DiCampo is a humanitarian photographer and co-founder of @EverydayAfrica project on Instagram, who lived for three years in Ghana as a PeaceCorps volunteer and freelance photographer. He now resides in Seattle, Washington. 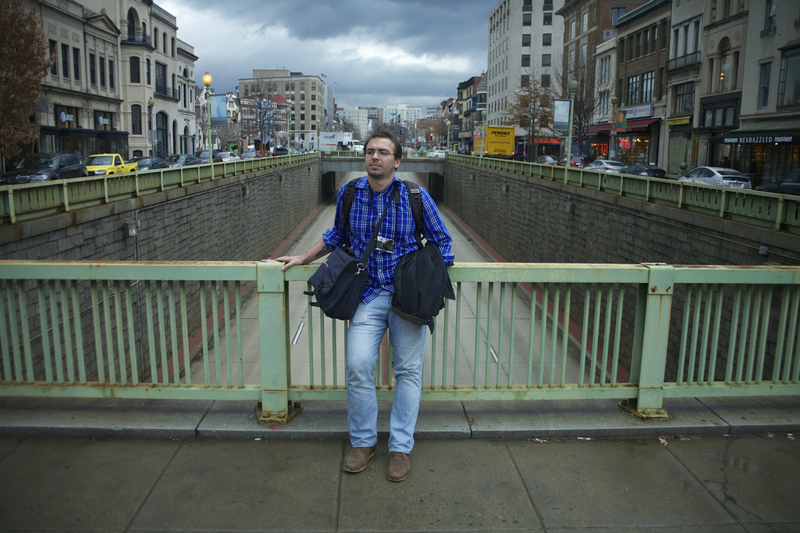 His projects range from “Life without Lights” documenting energy issues, to Everyday Africa, to a new series he is setting out on to document failed aid. How did Everyday Africa come to be? Co-founder Austin Merrill and I were traveling in Ivory Coast in March 2012, doing a story on the situation there one year after the close of their civil war. Austin had lived in Ivory Coast for years at a time prior to that, and I had lived “next-door” in Ghana, so even as we traveled the country reporting on continued violence, refugees, gender-based violence victims, etc., we saw a lot of common situations that felt much more familiar to us. 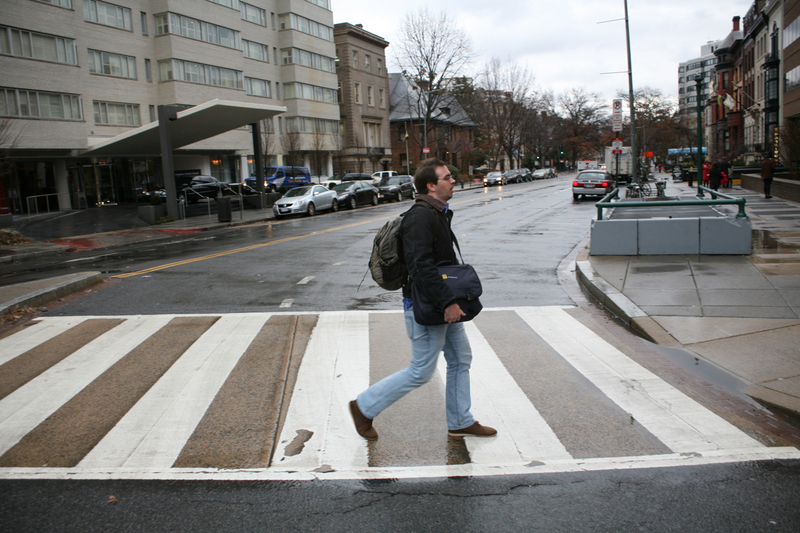 It seems clear that many journalists see these moments all the time when traveling for a story, but we usually have to edit ourselves as we go, disregarding that doesn’t fit the narrative of our story. By casually shooting these moments with our phones and making it into a separate project, Austin and I were able to place more emphasis on the normal and find our own means of distribution. It wasn’t long before other photographers — who shared the same frustrations in the field — asked to come on board, and the larger project was born. Left: A young girl in her parents’ roadside shop in Duekoue, Ivory Coast. 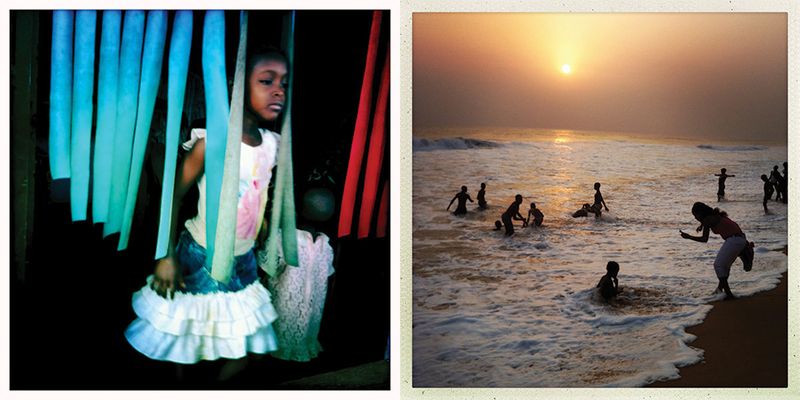 Right: A woman photographs children playing in the ocean in Grand-Bassam, a popular beach community outside of Abidjan, Ivory Coast. What is a photograph you have taken that really stands out to you? There is one picture that I have that I took very early in my PeaceCorps journey, in the first month of living in my village, of these girls fetching water from this hand pump. To me, it’s a really important picture because I think if you had asked me today to take a picture about development issues, I would still go and try to take the very same picture. The girls are kind of hanging off of this pipe system as they wait because it barely works – it took about 45 minutes for them to fill a bucket. To me, it’s a picture of short-sighted development, and at the same time, gender issues. In the back ground of the photo there are boys relaxing while the girls are trying to fetch water. As far as gender issues go, this is typical in poverty — half of their people are designated as laborers and those people are often women and girls. Are there any reactions you’ve heard to any of your projects that really stick out to you? There was an exhibition of the Life without Lights project, the Ghana chapter, in London, and I had a Nigerian guy come up to me. He was really upset that I was continuing down this path of showing Africa’s problems. And that’s always stuck with me. It does have problems, and it has problems that need to be told in story form, but it’s time to think of it as any other place. It is time to look at it as a place with positive stories and also with the simple and mundane happening. And that’s where Everyday Africa comes in. As a whole, a lot of Africans I’ve talked with love Everyday Africa, and there are some who are like, how can you call this project everyday Africa when you aren’t African? How can you speak on our behalf? The goal was never to speak on someone’s behalf, but that part of the reason we’re expanding so much and reaching out to more African photographers is because we realize it needs this. What is some advice you would give to someone interested in pursuing a similar path? Generally speaking, now is the time to take this strange veil off that we’ve been wearing when we look at Africa, and look at it with a sense of reality, of what is really there. For photographers, I would say to try to really live there. If all I ever did was go on trips to Africa and come back after two weeks at a time, I think my photography would be more generic and more poverty-based. If we’re really living in a more globalized society, then we have to start creating stories that reflect that. In some ways, it’s time to look at Africa as just any other place instead of having this strange mystique about it. On a completely different note, if you could have a one-on-one sit down with anyone in the world, who would it be and why? Does it have to be one person? I tell you what, I think that what I would really love to do is have this sit-down group session with Hunter S. Thompson, the writer Neil Gaiman, the comic book writer Alan Moore, Chimimanda Adichi, who is the Nigerian author, and I’ll throw Chinua Achebe in there as well. I’d tell them that the theme of the conversation is stories and how the stories that we tell about a place or a culture form our opinions of that culture, and see where it goes from there. Any guesses on where it would go? I think the only answer is all over the place. A couple of those writers are fantasy and comic book writers, but those are the first writers who really taught me what the essence of a story is, and that it’s a place where we contain all of our cultural beliefs and put it in there for safekeeping to teach to the next generation. And then people like the two Nigerian writers who I mentioned, who show to just what degree that works on a cross-cultural level. That we have these very limited stories of other places and that we form our opinions based on that—it’s such a powerful thing if we can move beyond that. 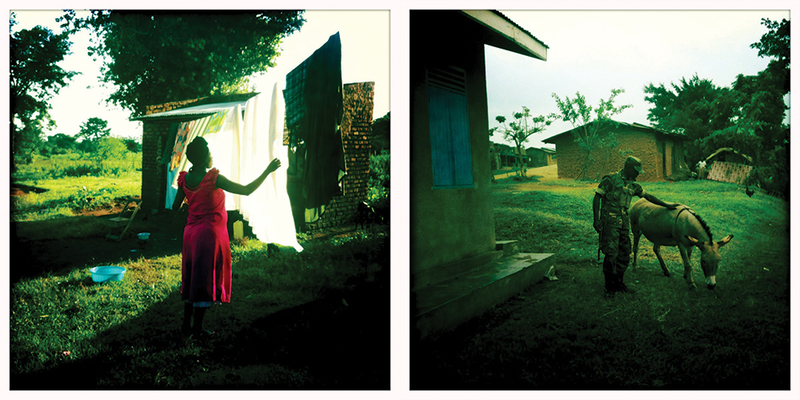 Left: A woman hangs laundry in Takira, Uganda on May 29, 2012. Right: A Ugandan soldier pets a donkey in Kakuka, Uganda. How can people or companies serve Africa better? I really appreciate the model that Oliberté is taking, because I think that’s one way we can serve Africa better. There’s this perception of Africa that it’s a culture that needs everything and has nothing – and this leads into the project I’ve been doing on failed aid projects – this idea that anything you give is needed. This leads to so much weird stuff being given. So when you start to look at development models that are based off of economic opportunity, then a whole new set of doors open. What can we expect to see next? We’re currently expanding Everyday Africa into its own online platform and educational curriculum that involves teaching kids in schools in the States, comparing news imagery to this imagery, comparing what the differences are in what they are taught in Africa based on that. On March 31st, we had the first of an 8 week session with local 8th graders at the Bronx Documentary Center, where we use Everyday Africa photos as a jumping off point to discuss media creation and stereotypes. The students are discussing how photography creates and can break down stereotypes, and then photographing their own community. Check out one of Peter’s favorite photographers, Ghanaian Nana Kofi Acquah, at @africashowboy on Instagram, and Everyday Africa at @Everydayafrica on Instagram or everydayafricaproject.com. Follow Peter at @pdicampo, peterdicampo.com, lifewithoutlights.com Photos of Peter by Austin Merrill, co-founder of Everyday Africa; Everday Africa Instagram photos by Peter DiCampo.